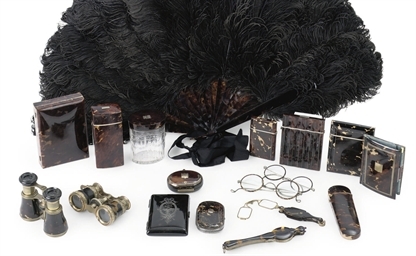 Other materials such as celluloid, Lucite, Bakelite, horn, bone and plastic can all be mistaken for tortoiseshell, especially if looking at pictures alone. In order to identify genuine Tortoise Shell, apply a hot pin to a hidden spot; if the resulting smell is similar to burned hair and a black spot is left, it is likely to be Tortoise Shell. If there is a plastic smell it is not Tortoise Shell. You can also run it under hot water to see if it gives off a plastic smell. Another way to tell is have a look at the markings; real Tortoise Shell is not regular in it’s marking and will have a distinctive luminosity when held to the light. There will also be a slight unevenness to it that cannot be found in molded materials. Upon close inspection, one can often see fine knife marks where the tortoiseshell was carved by hand. 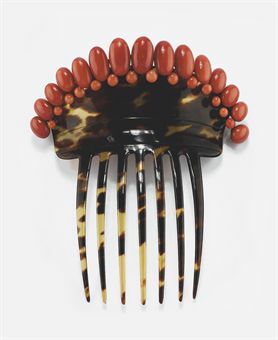 Most Tortoise Shell is the dark brown or reddish-brown variety with translucent amber high-lights but it can also be a uniform dark brown with no amber. Generally speaking, the older and more well worn the piece, the darker the Tortoise Shell, even appearing quite black in very old pieces. Tortoise Shell can also be the ‘Blonde’ or ‘Demi-Blonde’ variety in which case it will not be dark, but will still darken with age. Blonde Tortoiseshell is rarer and is considered more valuable and can range from an even pale yellow to a deep amber color. Tortoise Shell can also be stained different colors. 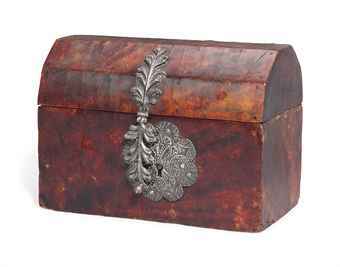 An enormous variety of boxes, from snuff boxes, to trinket boxes, to jewelry boxes to tea caddies were created with Tortoise Shell. 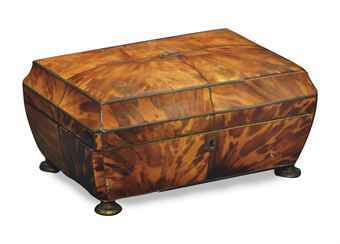 A REGENCY TORTOISESHELL COFFER-FORM TEA CADDY. Popular with both gentlemen and ladies. 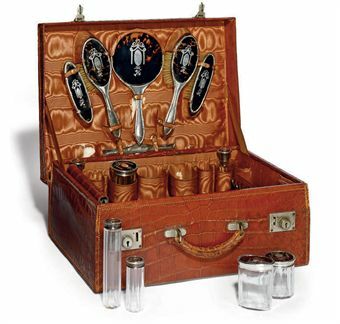 Perhaps the most popular use for tortoise shell was piqué, which involved the delicate inlay of gold and silver. 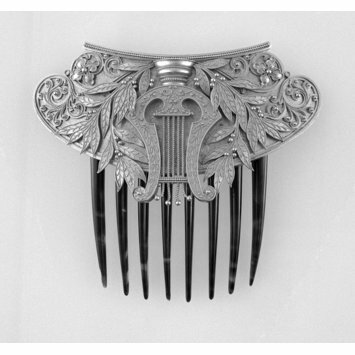 Every type of jewelry, earrings, bracelets, necklaces, rings and brooches, were produced throughout the Victorian era with this fine technique. 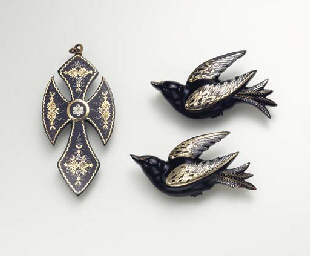 Earrings, tortoiseshell inlaid with gold and silver (piqué posé), English, ca. 1850. Mid to late Victorian Piqué single earring, converted into a contemporary pendant. Note the typical circular design with geometric motif. 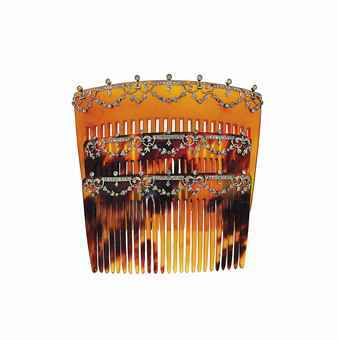 Piqué work was a method of inlaying gold, silver and sometimes mother of pearl into tortoiseshell and other materials to create truly stunning effects. Piqué originated in Italy in the mid 1600s and then spread to France where it was further developed as a technique. 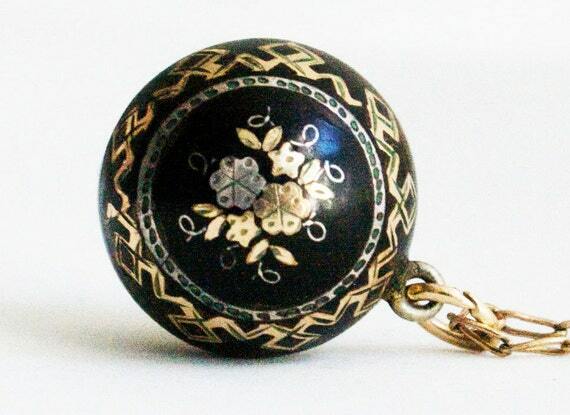 The English also enthusiastically adopted the method and English piqué jewelry is the most prevalent. 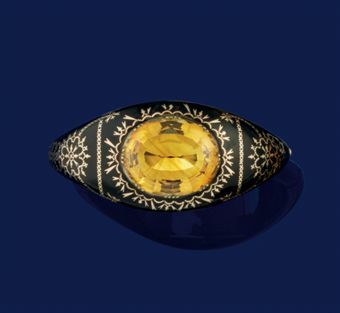 Jewelry was first made with this technique in the early 1800s and piqué jewelry peaked in popularity in the 1850s to 1880s. It was considered appropriate for mourning because of the dark colors. It quite abruptly ceased to be made almost entirely by 1885. Earlier designs were much more naturalistic and softer; later designs became more geometric as production methods became more mechanized. Generally, pure gold and silver were used as the metals. 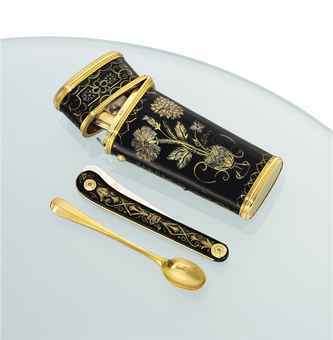 It is quite difficult to metal test such small amounts of metal but it can generally be assumed that if you have a piece of genuine tortoiseshell and the design is well executed that the gold or silver is high carat. Sometimes brass was also used. In order to embed the metals, the tortoiseshell was heated up first which caused it to expand and soften whilst the metals were worked in. 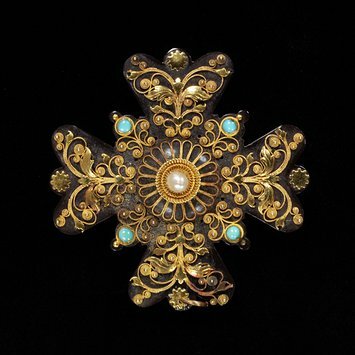 There were two types of piqué work: piqué point, in which gold or silver pins are driven into the tortoiseshell or other material to create the design and piqué posé, in which the design is engraved and then threads or small pieces of gold and silver are used to fill it in. You will sometimes hear piqué referred to as piqué d’or but this is only correct when referring to gold piqué work. Two major piqué artisans were: Laurentini and Charles Boulle. 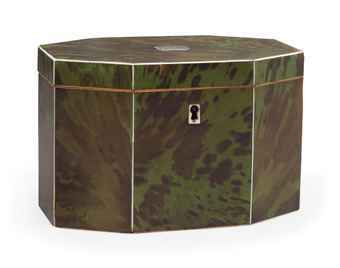 Christies sale 1447, 14 December 2004, New York, Rockefeller Plaza. Christies sale 5639, 19 January 2010 Jewels at South Kensington. 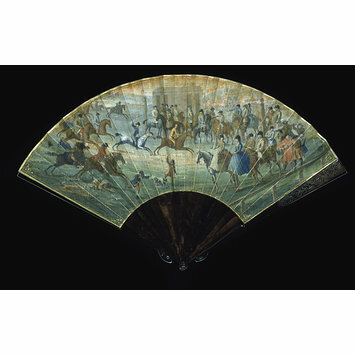 Piqué work was of course worked into different materials other than tortoiseshell, particularly celluloid which can appear quite similar to the untrained eye. One method for testing for tortoiseshell is to burn a very small place with a hot pin; if you smell burning hair it is most likely to be tortoiseshell. Another test to see if it is celluloid is to run it under very hot water; if it gives off a plastic smell it is celluloid. However, the absolute best way is to handle enough pieces so that you know the difference by eye. Another base material I have seen is wood. 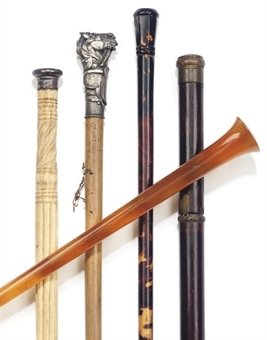 The other materials sometimes used were elephant ivory and horn although less commonly for jewelry. 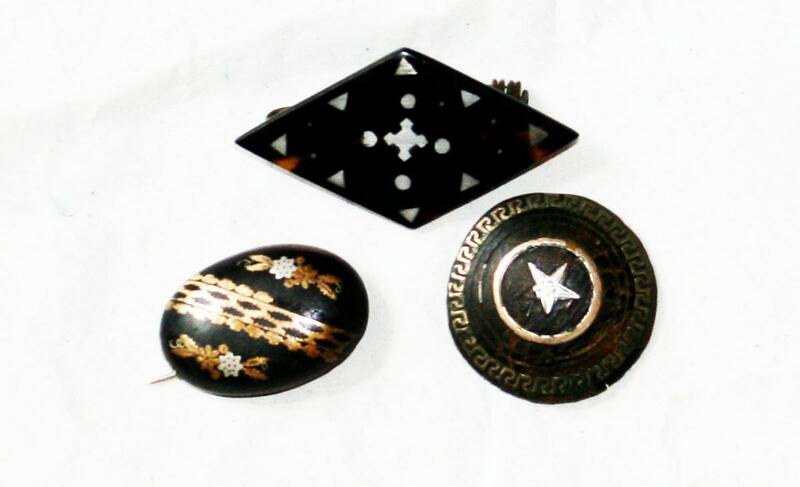 As assortment of piqué brooches using inexpensive faux-tortoiseshell materials as a base (the top is likely an early plastic and more contemporary, the one on the bottom left is probably celluloid and the one on the bottom right is wood). Today, piqué jewelry is considered extremely collectible. It can never be made again as of course tortoises and elephants are protected species. Available Piqué jewelry is therefore only going to become rarer. 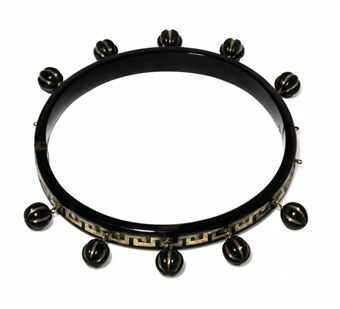 Piqué jewelry is truly marvelous to behold, very wearable and absolutely beautiful.